Customers of Access Bank, UBA and Ecobank in Benue have continued to groan following the seal up of their premises by the Board of Internal Revenue Service (BIRS), over alleged tax default. 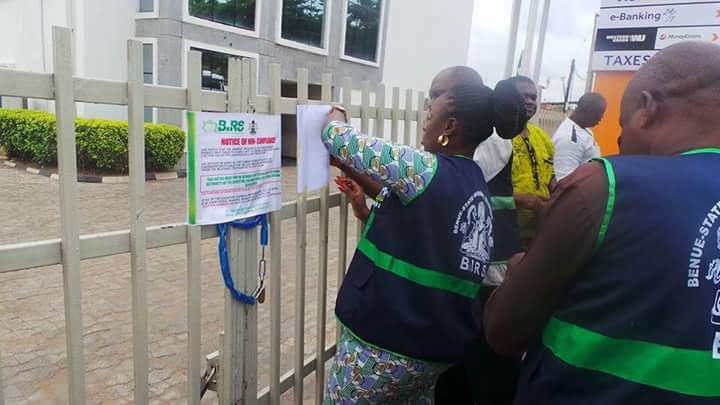 The News Agency of Nigeria (NAN) reports that the banks were sealed along with three other financial institutions on April 18, by the board over non remittance of Personal Income Tax/Assets and withholding tax to BIRS. The Executive Chairman of the Board, Mrs Mimi Orubibi told NAN on Monday in Makurdi, that though Ecobank and UBA had made some payments, the banks would remain sealed. “Two banks after making some payments refused to write undertaking specifying when to pay the remaining balance. “Ecobank has paid N50 million out of the N168.5 million but they refused to write an undertaking stating when to pay the remaining balance just like UBA that paid N21 million so far out of the N186 million tax default, both remain sealed. “The management of Lower Benue River Basin Development Authority (LBRBDA) has made an offer of N5 million out of the N225 million they are owing and we rejected it, other places sealed are yet to approach the board.’’ she said. NAN reports that all the banks’ branches in the state had also been sealed. The revenue boss said the board was enforcing the orders of a Makurdi High Court to seal up the banks and other defaulting institutions. She alleged that Ecobank Bank owed N168.5m. UBA N186m, while Access Bank owed N14m unpaid taxes. According to her, Ostrich Bakery owes N47 million, LBRBDA N225m, while Nile Drill Technologies owes N4 million. “The closure of the outfits is in compliance with Section 104 of the Personal Income Tax Act, 2011 (amended), and Section 41(1), (3) and (4) of the Benue State Internal Revenue Administration Law 2015,” she explained. Orubibi said other organisations that their premises were sealed for the same offenses include: Ostrich Bakery, Nile Drill Technologies and LBRDA, all situated within Makurdi metropolis. She said that LBRBDA’s headquarters in Makurdi was sealed due to its failure to pay the assessed PAYE Taxes/liabilities, withholding tax and other levies. The chairman claimed that the accounts of the affected companies were audited between 2009 and 2014, while some had their accounts audited between 2011 and 2015, but all failed to remit their taxes. NAN correspondent who visited the banks reports that customers were seen standing dejectedly as they could not enter to transact business, while the headquarters of LBRBDA remain sealed. A customer of one of the banks, Mr Jacob Abba, expressed frustration and disappointment as the situation had created hardship, especially in feeding his family. Abba described the bank as an irresponsible financial institution. He threatened to sue the bank if it continued to fail in fulfilling its social contract with her customers in the state. “I have never seen a situation like this in my life where a bank will close in a state, forcing its customers to suffer simply because it failed to remit tax,” he said. Also, Miss Joy Auta, a civil servant, said the bank had `disgraced’ the banking sector, adding that they were suffering for no fault of theirs. In his reaction, the Managing Director, Lower Benue River Basin (LBRDA), Mr Mohammed Adra told NAN that the office had opened discussion with the board over the issue. Adra explained that though the tax invasion incident occurred between 2011 and 2015 when he was yet to be appointed the managing director, adding that upon assumption of office he accepted both assets and liabilities. He said the management would investigate to ascertain exactly what led to the tax default.